Chronic knee pain, due to various reasons, plagues millions of people. Sometimes prescribed medications help, but often times they prove ineffective. 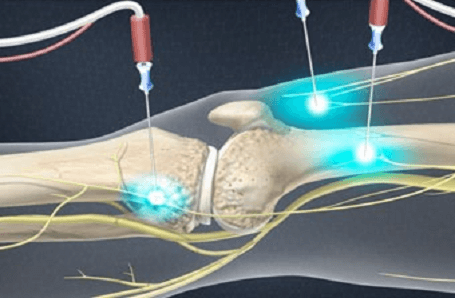 An alternative treatment to surgery is the two-part genicular nerve block with radiofrequency ablation, also called a genicular nerve neurotomy. The therapeutic treatment option involves a diagnostic procedure followed by a procedure with long-term pain blocking results. The knee is innervated (supplied) by the articular (related to joints) branches of a set of nerves. The set of nerves are referred to as genicular nerves, and they are responsible for transmitting pain from the knee. A geniculate block knee treatment attempts to stop all or most of the pain by blocking the nerve supply. The procedure involves a physician injecting a local anesthetic into three genicular nerves to interrupt pain signals while using fluoroscopic (live X-ray) or ultrasound guidance. Sometimes a steroid is also injected to reduce inflammation. The knee block procedure is primarily used as a diagnostic treatment to determine which nerves are causing the pain and if nerve blocking works. If the nerve block is successful, pain relief begins within an hour, but the relief is short-lived. The nerve block’s effects last from eight hours to a maximum of 24 hours. If the first block works, the diagnostic test is performed a second time before the next step is taken. Generally, if pain is reduced by at least 50 percent both times, the physician knows that blocking certain nerves does work and will proceed with a longer-lasting treatment called a radiofrequency ablation of genicular nerves. need pain relief before or after knee surgery. During the procedure, the patient lies on a procedure table, and the body, except for the knee being treated, is covered with a sheet. The physician sterilizes the injection sites and numbs them with an anesthetic. Using a fluoroscope (or some type of technology) as a guidance system, a cannula (needle with a thin tube) is inserted into the correct position near a genicular nerve. While inserted, a local anesthetic is administered to numb (block) the nerve to stop pain signaling. This procedure is repeated until several (usually three) genicular nerves are blocked. In some cases, people are sedated, so they do not feel any pain from the injection. Once discharged, it is recommended that strenuous activity be avoided for at least 24 hours. However, it is also important to resume normal moderate activities that previously caused knee pain. This helps to determine whether the genicular nerve block for knee pain is working. The longer-term pain relief treatment is the radiofrequency ablation procedure. During this genicular nerve block treatment, patients that responded well to the diagnostic nerve block undergo the ablation procedure, usually done with local anesthetic on an outpatient basis. Once again, fluoroscopic or ultrasound guidance is used. First, a local anesthetic is applied at the injection sites except when it is determined the patient should be first moderately sedated via IV. 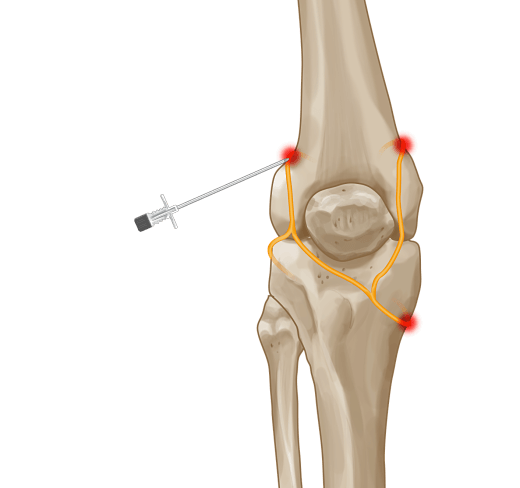 A cannula is guided as close as possible to the appropriate nerves, one at a time. Once in place, radiofrequency lesioning (ablation) involves inserting a microelectrode into the cannula so that an electrical current produced by a radio wave can heat up the tip of the needle. The hot tip of the needle then cauterizes the nerve transmitting pain signals, so it cannot transmit pain signals to the brain. The process is repeated for each nerve. The pain relief from the genicular nerve ablation procedure can last from six months to one year, or even longer. It is a low risk procedure that is done on an outpatient basis. There is no reason to live with chronic knee pain when minimally invasive procedures, like the geniculate block knee treatment, are available. Speak with a physician about the medical treatment options, and together determine the best route for achieving pain reduction.